San Francisco police have determined that the truck driver who killed Amelie Le Moullac on her bike this month was at fault for the crash, after footage of the incident was found by the SF Bicycle Coalition. SFPD Chief Greg Suhr has also apologized in statements to the press for the behavior of Sergeant Richard Ernst, who stopped by at a rally and memorial held in Le Moullac’s honor to harass bicycle advocates and blame victims killed on bicycles this year for their own deaths. The determination of fault in the crash at Folsom in Sixth Streets, first reported by the SF Chronicle’s Chuck Nevius, apparently confirms that the driver made an illegal right turn in front of Le Moullac, failing to yield and merge into the bike lane. The SFPD, which had initially indicated that there was no wrongdoing on the part of the driver, says that it will submit the case to District Attorney George Gascón’s office, who will decide whether or not to press criminal charges, according to the SF Examiner. The DA’s office has reportedly not received the case yet. “I feel very badly about it, and I can’t tell you how sad the department is that this young gal lost her life, and our thoughts and prayers are with her family,” he said. Still, Liberty said Suhr hasn’t returned her phone calls offering him the opportunity to apologize to the family personally. “Solely making a statement to a reporter seems a little like damage control when the family is here and available, and would love to hear from the chief himself,” she said. I’m sensing a change in mentality here, one that we all need to continue to advocate for. It’s just a sad statement that there is any possibility that someone does not have equal rights the second they sling their leg over the tube. As usual, someone had to give their life for this change in mentality to occur. Someone who was someone’s lovely daughter. It really shouldn’t have to come to this. 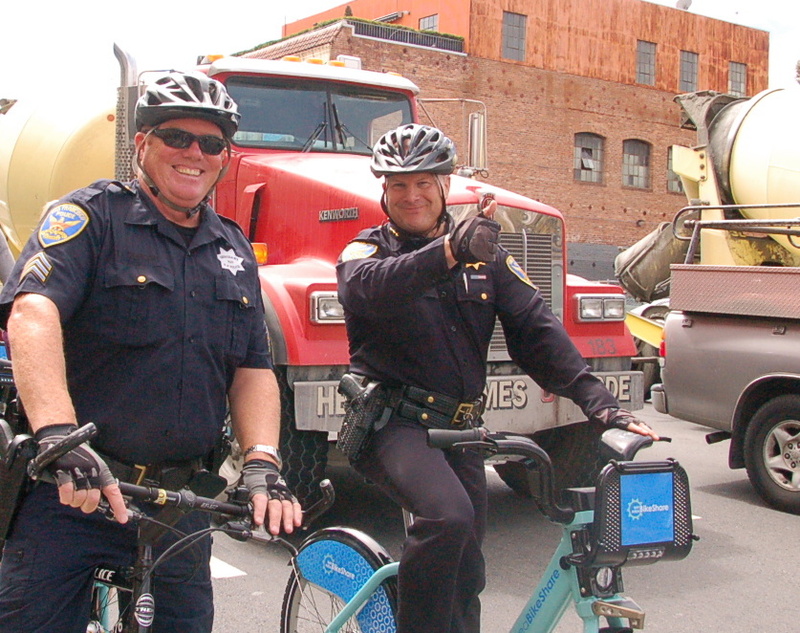 Heads up: SFPD is ticketing bicyclists riding the Wiggle today for rolling stop signs. This is the same biased agency that routinely fails to cite motorists for killing and maiming pedestrians, bicyclists and each other. This is the same biased agency that lies about their criminally shoddy “investigations” into how those killings and maimings occur. This is the same biased agency that fails to excoriate its biased officers when they harass cyclists calling for better streets, and are seen on television wrongfully blaming victims for their own demise. Bias, bias, bias. Did you ask them if they had video evidence you ran the stop sign? I’m sure they’d be right on it! This is so irritating. How about these guys come sit at Cesar Chavez at the Hairball and watch how many motorists nearly kill me every time I try to get under that god-forsaken beast that is 101 on my bicycle? This is just one example of an intersection where people’s lives are actually at risk, but never once have a seen a cop hang out there and do something about these crazed motorists who think Cesar Chavez is a freeway. Nocomment on punishment for Herr Ernst? Consequeces need to befall this Nazi. Why do you need to be heads up about police enforcing traffic laws if you follow them? Oh, that’s right, bikers don’t. I’m all in favor of car drivers getting tickets for not following the law. I’m not going to warm them of enforcement so they can avoid a ticket today and go back to breaking the law tomorrow. Not all jerks are Nazis. All DUI checkpoints are blasted on the news for days prior to the actual date of enforcement. It would be police enforcing traffic laws if they ticketed the vast majority of car drivers who fail to come to full and complete stops at the same intersections. Instead, this is a sting operation aimed exclusively at cyclists. And it’s probably retaliation for my strongly worded article to boot. Why would we need to publicize DUI checkpoints, crackdowns on speeding, and crackdowns on driving-while-texting if motorists follow the law? Oh, that’s right, motorists don’t follow the law. but all cyclists are, right? I’m all in favor of drivers and cyclists getting tickets for driving/riding *dangerously*. The most dangerous behavior should be the most heavily enforced. For example, I don’t want to see all the cops spending their time stopping people for driving 5 miles over the limit on the 101 (because that’s where it’s easy to issue many tickets at once and meet a quota), leaving no resources left for people running red lights, speeding through residential zones, and driving drunk/stoned. Similarly, I would be happy to see cops stopping cyclists who cut off pedestrians, blow through red lights, ride on the sidewalk, ride the wrong way on the street, and ride without lights at night. But not ticketing cyclists who roll through stop signs with no traffic (the bike equivalent of going 5 miles over the limit). Probably none are. Do you think there are any 90+ year old bikers around that were Nazis? Maybe one old man in Argentina? I’m good with that. Add to that, ticketing jaywalkers in certain circumstances too. Folks need to understand that while their law breaking might seem like no big deal it can have a dangerous indirect impact on others. This is called “collective punishment”. Bicyclists are being punished as a class because they dared to (a) point out SFPD’s gross incompetence, and (b) challenged Sgt Ernst’s egregious behavior. Name calling isn’t necessary here. Actions speak louder than anything else. Deliberating parking his car illegally during a memorial service for Amelie to harass her grieving family is beyond reprehensible…He’s disgusting and an embarrassment to himself, his family, to SFPD and citizens everywhere. It’s up to Suhr to make sure he deals with the matter in a manner that makes sense to the the LeMoullac family, SFBC, and to all citizens of the greater Bay Area. I speak for myself, and I hope for others, when I say I’m not letting this issue fade away. Before we can change policy we need to change attitudes. This is horrible! I used to date her back in high school. Very sweet person. Super sad, prayers are with her sister and family. I work one block away in soma, and I can’t tell you how many times drivers don’t pay attention to pedestrians and bicyclists alike. So the DA has still not pressed charges here, right? Has SFPD even completed the case yet? We need an update on this case. Keep their feet to the fire!